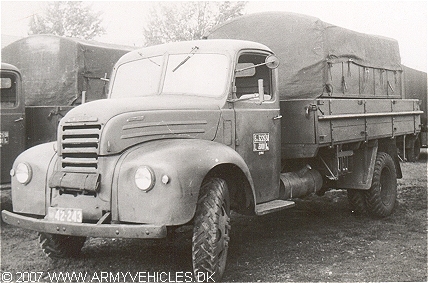 Danish Army Specific: Introduced in the Danish Army in 1954. Each truck was around 18.000,- Kr. a piece. The chassis were delivered through Ford Motor Company A/S in Copenhagen. The bodywork was made by Ringsted Karosserifabrik. Used for cargo, drivers training and as compressor truck (95 kb) by the engineers. Historical: The Ford Thames was introduced in 1949 to replace the pre-war Fordson 7V range. It was available in a choice of wheelbase lengths and weight classifications covering 2 to 5 tons. Sussex made a 6 x 4 conversion for heavier loads. The ET7 used Fords well known V8 petrol engine and the ET7 a Perkins P6 diesel. The cab was designed by Briggs Motor Bodies. Length: 6.55 m (255 inches). Width: 2.30 m (90 inches). Engine: V8-cylinder, 3.622 cm3 (221 cubic inches), liquid cooled. Horsepower: 85 at 3.500 rpm. Fuel capacity: 63 liter (14 gallons).